- Are Florida Democrats Trying To Steal The Elections? We had hoped after the midterm elections across the country we could at least take a week to not speak about elections, but alas, once again, Florida, specifically two liberal counties in Florida, Broward and Palm Beach, have managed to muck up the entire election process in such a spectacular example of corruption and incompetence, if it weren't so vitally important and pathetic, it would be laughable. WHAT ARE THE DEMOCRATS HIDING IN FLORIDA? Broward County, Florida: We'll begin with Broward County, where Supervisor of Elections Brenda Snipes, who has a "long history of trouble" as detailed by the Sun Sentinel, including a court ruling that she broke election law by destroying ballots, leaving major amendments off ballots in 2016, and suddenly discovering almost 1,000 ballots in 2012, a week after the election, is once again in the spotlight for incomptence at best and utter corruption at worst, possibly even a mixture of the two. In the days since Tuesday's midterm elections across the country, Broward County mysteriously "discovered" nearly 80,000 additional votes, affecting the Florida Senate race between the current Florida Republican Governor Rick Scott, and incumbent Democratic Senator Bill Nelson as well as the Governors race between Ron DeSantis and Andrew Gillum. On November 7th, the day after the midterm election, Governor Scott was leading Senator Nelson in the Senate race by 38, 717 votes, according to Florida Today, and with the newly "discovered" ballots, that lead is now down 12,500+ votes, showing the extreme difference the extra ballots and election antics on the part of Snipes has made in favor of Nelson. 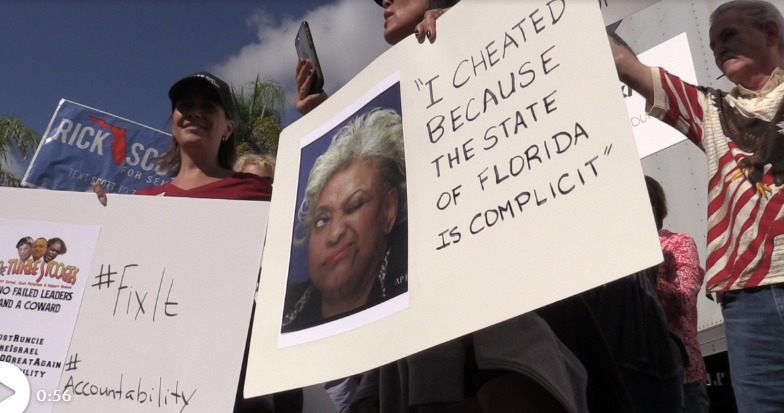 Those antics include refusing to report vote tallies according to Florida law, forcing Governor Scott to file a lawsuit for an emergency hearing to force Snipes to provide the information to Republicans that she was already required by law to provide but wasn't doing. Judge Carol-Lisa Phillips sided with Scott by ruling there has "been a violation of the Florida constitution," by Snipes and her officials, as well as the state’s public records act, by not turning over requested records. Further muddying the water, it appears that Snipes also "accidentally" mixed in rejected ballots with valid ones, a mistake which was only found after Snipes handed over 205 provisional ballots to the Broward County canvassing board for inspection, according to the Miami Herald, which is the largest newspaper in South Florida. On Election Day, Broward election staffers set those 205 votes aside, removed the anonymous ballots from their signed envelopes and counted them up in a voting machine that didn’t add those numbers to the final vote count. The elections department didn’t originally intend to have the canvassing board review those votes, but after uproar from lawyers for the Republican Party, the office handed them over to the board, which usually reviews ballots still in the envelopes. “The ballots cannot be identified,” Snipes confirmed when a lawyer for the Republican Party asked. The Florida Senate and Governors' races are not the only elections that Snipes utter incompetence and election foul play are affecting, as the Republican candidate for agricultural commissioner, Matt Caldwell, has also filed suit against the Broward County Supervisor of Elections, "asking the court to protect the integrity of all ballots and all public records relating to the election for Commissioner of Agriculture," as reported by News-Press. Things get worse believe it or not, as former Florida Lieutenant Governor Jeff Kottkamp is claiming that an "Affidavit filed by Broward Election’s employee in support of Caldwell lawsuit provides eye witness account of Elections staff filling in blank ballots. When this was reported the employee was fired and told not to come back." 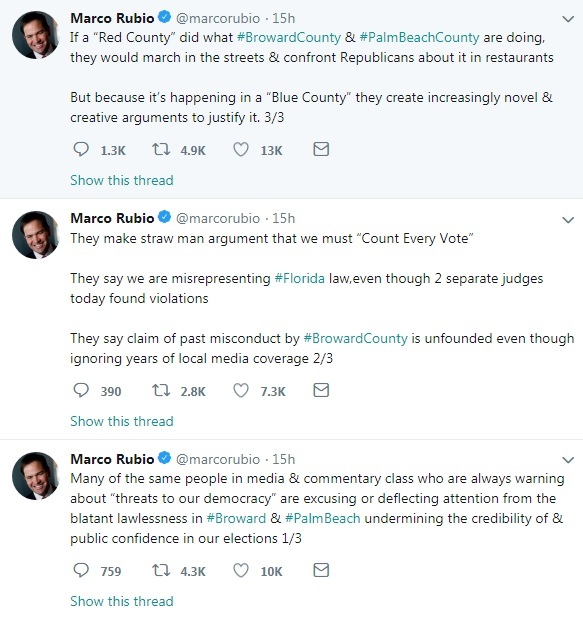 Palm Beach County, Florida: Next we have Palm Beach Country, Florida, another liberal enclave that apparently is having their own set of issues, including banning media cameras from the public ballot counting, then threatening them with arrest. 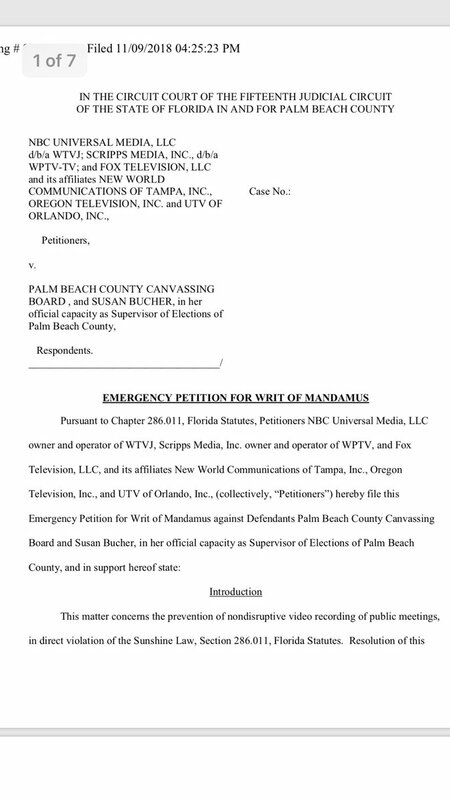 NBCUniversal, Scripps Media, Fox Television and others, immediately filed an emergency motion for a Writ of Mandamus against Election Supervisor Susan Bucher and the canvassing board. According to Marissa Bagg of NBC6, "Judge agrees with @NBCNews, @nbc6 and other media outlets— cameras are now allowed to record inside room where provisional ballots are being reviewed by canvassing board in Palm Beach County." The issues in Palm Beach do not end there either as Governor Rick Scott was forced to go to the courts again against Bucher for withholding crucial information regarding the vote counts. In that case Chief Judge Krista Marx sided with Scott and "ruled that Bucher's office violated state public records laws and ordered it to hand over "overvoted" and "undervoted" absentee ballots deemed defective by county election officials to the canvassing board for review before they are counted," according to The Hill. Florida Representative Matt Gaetz highlights that the issues with Broward County are not an issue with "Florida" but just the Democrat strongholds alone, stating "65 of the 67 counties got it right; it wasn't broken for them, they got it right. Orange County is huge, they got it right. Our most populated county, Miami-Dade, did everything right. This is not a Florida problem. This is a Broward County problem." In another court proceeding a judge gave Bucher an additional two hours to get the information the Scott campaign was suing for, while refusing to extend it the days Bucher wanted. More on that explained below. I am not sure how Florida residents, whether Republican, Democrat or Independent, can trust the results that include Broward or Palm Beach Counties, especially after hidden ballots, the refusal to provide even the basic information about how many ballots were cast, where they were cast and when they were cast, the nearly 80,000 ballots "discovered" after the polls were already closed, and the other issues that have plagued Broward Country and to some extent, Palm Beach. I am also not sure a machine recount, using ballots that may have been tampered with, will be acceptable, and there may be more legal action to demand a manual hand recount of the ballots themselves, but even then, with so much information hidden from the public, how can Floridians even trust any of the newly "discovered" ballots at all?